Having trouble getting in the holiday spirit this year? 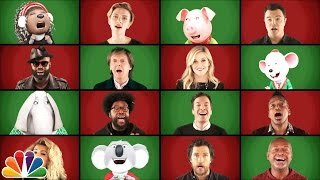 Jimmy Fallon, the Roots, Paul McCartney and the cast of “Sing” teamed up Tuesday night for an a cappella version of McCartney’s song “Wonderful Christmastime” complete with “bum-bums,” “da-da-das” and plenty of holiday cheer. The video, shot in a “Brady Bunch”-style colorful split over a snowy backdrop, opens with Fallon and the Roots and gradually adds more voices and characters. This was the 4th concert played at NBC Studios. Pre-recorded a cappella performance with Jimmy Fallon, The Roots, Matthew McConaughey, Reese Witherspoon, Scarlett Johansson, Seth MacFarlane and Tori Kelly.